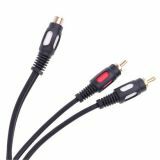 Cable stereo plug 3.5mm/M-2xRCA, black, 2m Cinema cable CABW22200AT20 with jack 3.5 stereo male to 2 x RCA male and length 2 m. High quality product ideal for connecting home theater to PCs, laptops and more. Car audio amp cable 2RCA-2RCA+REM, 5m Car audio amplifier cable with 2RCA - 2RCA plugs and REM cable for amplifier control. Length - 5 m.
Cable 5DIN/m-4xRCA/f, 0.2m Cable 5DIN to 4xRCA/f for trnafer of A/V signal. Cable, 5DIN/m-2xRCA/m, 1.5 m Cable caps 5DIN / m to 2 x cinch RCA / m for all kinds of AV and Hi-Fi equipment and components, length 1.5 m. Quality product from the Valueline series. List Price 2.80лв. VAT Incl. 2.66лв. VAT Incl. 2.52лв. VAT Incl. S-VIDEO+RCA F, mini DIN7 M, black Cable Mini-DIN 7-pin / m to Mini-DIN 4-pin S-Video / f + RCA / f for transfer and separation of composite video signals from PC to the S-video or RCA reciever as TV. Cable, RCA/f-2xRCA/m, 0.2m Cable, from RCA/f to 2xRCA/m, with legth of 0.2 m.
List Price 5.25лв. VAT Incl. 4.99лв. VAT Incl. 4.72лв. VAT Incl. Cable, 2xRCA/m-RCA/f, 0.2m Cinch cable, 2 x RCA / m to RCA / f for all types of AV and Hi-Fi equipment and components with length 0.2 m.
List Price 1.50лв. VAT Incl. 1.35лв. VAT Incl. 1.27лв. VAT Incl. 1.20лв. VAT Incl. 1.12лв. VAT Incl. Cable, 2xRCA M-2xRCA M, 1m Cable 2 x RCA / m to 2 x RCA / m + 2xRCA / f for any kind of AV and Hi-Fi equipment and components, with a length of 1 m.
Cable, RCA/m-RCA/m, 1.5m, gold plated plugs Cable RCA / m to RCA / m for any kind of AV and Hi-Fi equipment and components, 1.5 m long. Cable, 2xRCA/m-2xRCA/m, 1.5m Cable with connectors, 2xRCA/m to 2xRCA/m, 1.5m long. List Price 2.00лв. VAT Incl. 1.80лв. VAT Incl. 1.70лв. VAT Incl. 1.60лв. VAT Incl. 1.50лв. VAT Incl. 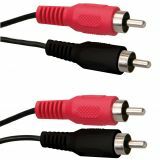 Cable SWOP24200E15, 2xRCA/m-2xRCA/m, 1.5m Cinch audio cable 2 x RCA / m - 2 x RCA / m, 1.5 m long for all AV and Hi-Fi equipment and components. List Price 13.50лв. VAT Incl. 12.15лв. VAT Incl. 11.48лв. VAT Incl. 10.80лв. VAT Incl. HQ Cable 2xRCA/m-2xRCA/m, 5 m HQ Cable 2xRCA/m to 2xRCA/m, with length 5 m.
Cable, 2xRCA/m-2xRCA/f, 2m, KONIG Cable 2xRCA male - 2xRCA female 2 m long. Cable, 3xRCA/m-3xRCA/m, 15m AV and Hi-Fi Cable, 3 x RCA/m - 3 x RCA/m, with length 15m.